VirtualDek 2.0 is a Proffesional DJ Studio designed for the PC. It runs on Windows based platforms including Windows 98, ME, CE, 2000, 2003, NT, XP. VirtualDek 2.0 is the next generation in PC based DJ Mixing Software. VirtualDek 2.0 gives you the power to create stunning DJ performances right from the comfort of your PC or Laptop. Use at Home or even at Live Events such as Clubs, Discos or Karaokes. You can drop songs directly onto the Decks. 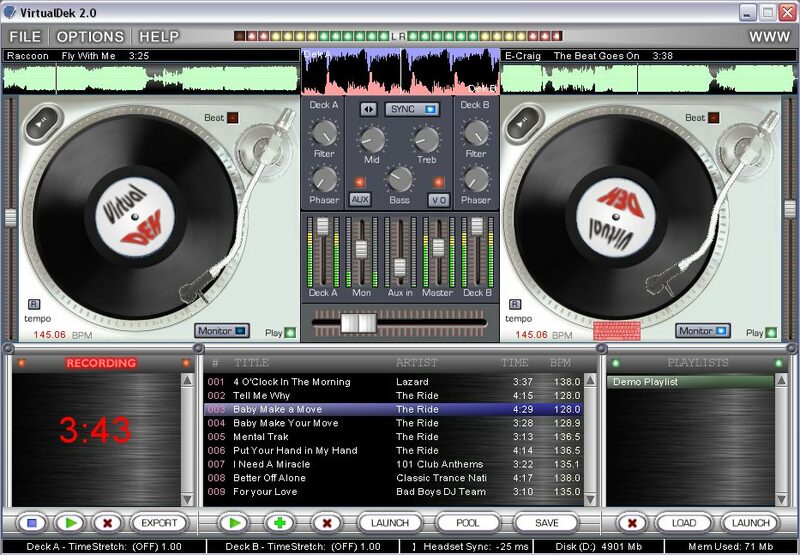 Mix and Scratch MP3, WMA, WAV's on 2 Virtual DJTurntables, with Beat-Matching ! VirtualDek 2.0 now offers the ability to use a USB Headset to Cue and Monitor Decks. You can also use a Microphone with VirtualDek 2.0 and add vocals to your Mix, so attention all MC's ! No more ducking the fader when you speak into the MIC as VirtualDek 2.0 now offers a Voice-Over feature which automatically ducks the music for you! VirtualDek 2.0 aims to satisfy those who require proffesional sounding results and who need Ease of Use, Flexibility and Speed. VirtualDek 2.0 offers superb Beatmatching that rivals other top selling DJ packages, keeping your Mixes Beat Perfect and your Tracks in time, therefore, saving you time ! VirtualDek 2.0 is based on simplicity and was designed to give the user the most Flexible, Powerful and Stress-Free DJ Mixing enviroment possible. With VirtualDek 2.0 - The crowd will love you ! Qweas is providing links to VirtualDek 2.0 as a courtesy, and makes no representations regarding VirtualDek or any other applications or any information related thereto. Any questions, complaints or claims regarding this application VirtualDek 2.0 must be directed to the appropriate software vendor. You may click the publisher link of VirtualDek on the top of this page to get more details about the vendor.